Commanders use the warfighting functions to help them exercise command and to help them and their staffs exercise control. A warfighting function is a group of tasks and systems (people, organizations, information, and processes) united by a common purpose that commanders use to accomplish missions and training objectives. 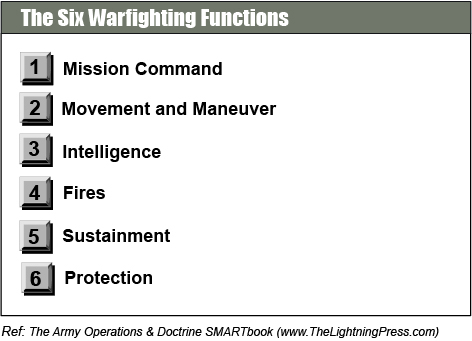 All warfighting functions possess scalable capabilities to mass lethal and nonlethal effects. The Army’s warfighting functions link directly to the joint functions. The mission command warfighting function is the related tasks and systems that develop and integrate those activities enabling a commander to balance the art of command and the science of control in order to integrate the other warfighting functions. Commanders, assisted by their staffs, integrate numerous processes and activities within the headquarters and across the force as they exercise mission command. The movement and maneuver warfighting function is the related tasks and systems that move and employ forces to achieve a position of relative advantage over the enemy and other threats. Direct fire and close combat are inherent in maneuver. The movement and maneuver warfighting function includes tasks associated with force projection related to gaining a position of advantage over the enemy. Movement is necessary to disperse and displace the force as a whole or in part when maneuvering. Maneuver is the employment of forces in the operational area. The intelligence warfighting function is the related tasks and systems that facilitate understanding the enemy, terrain, and civil considerations. This warfighting function includes understanding threats, adversaries, and weather. It synchronizes information collection with the primary tactical tasks of reconnaissance, surveillance, security, and intelligence operations. Intelligence is driven by commanders and is more than just collection. Developing intelligence is a continuous process that involves analyzing information from all sources and conducting operations to develop the situation. The fires warfighting function is the related tasks and systems that provide collective and coordinated use of Army indirect fires, air and missile defense, and joint fires through the targeting process. Army fires systems deliver fires in support of offensive and defensive tasks to create specific lethal and nonlethal effects on a target. The sustainment warfighting function is the related tasks and systems that provide support and services to ensure freedom of action, extend operational reach, and prolong endurance. The endurance of Army forces is primarily a function of their sustainment. Sustainment determines the depth and duration of Army operations. It is essential to retaining and exploiting the initiative. Sustainment provides the support necessary to maintain operations until mission accomplishment. The protection warfighting function is the related tasks and systems that preserve the force so the commander can apply maximum combat power to accomplish the mission. Preserving the force includes protecting personnel (combatants and noncombatants) and physical assets of the United States and multinational military and civilian partners, to include the host nation. The protection warfighting function enables the commander to maintain the force’s integrity and combat power. Protection determines the degree to which potential threats can disrupt operations and then counters or mitigates those threats.